I found this so adorable I just had to take a photo of him. 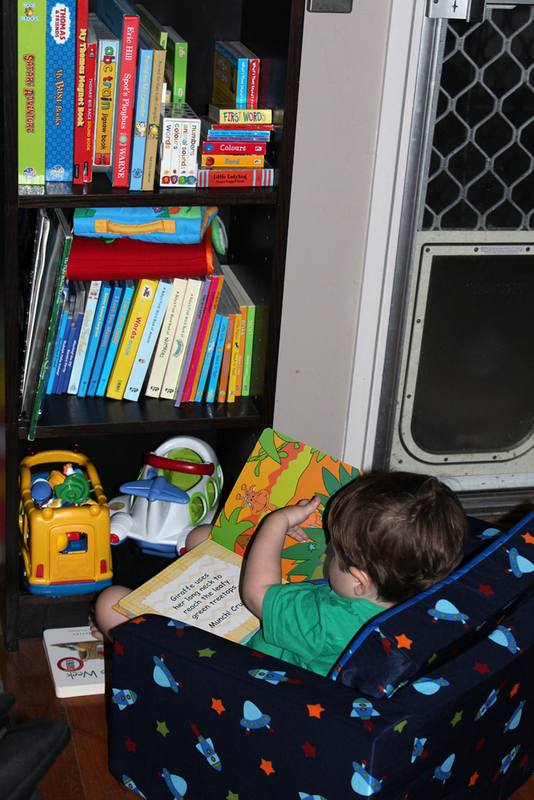 I was busy in the kitchen cooking dinner and I look over to find Addi sitting on his little lounge quietly reading a book. Earlier that day we moved his books to the shelf as the box was no longer big enough to fit them all in. It’s lovely to see that he likes the new place for his books. Love this photo as you know how much I value them loving books and learning. Also just wanted to say how good the website looks and how easy it is to find what I’m looking for. Hope you enjoy putting it together. It is so funny when the room goes queit and you think “where’s Addi?” Usually you find him hiding out in his tent playing with his soft toys or sitting reading on his own. Such a sweet nature he has. Glad you are enjoying the new website layout. I find the addition of the new calendar wonderful for looking back on a post on a particular day. For example if you wanted to look back at the photos from say my birthday or your wedding anniversary outing, you can simply click on the date and go straight to the post. Much easier than scrolling through the lot. I will be getting Charles to add a next and previous button for each blog post, that should make navigation even easier.